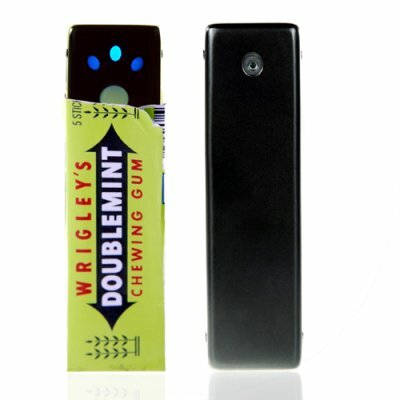 Successfully Added Mini Video Audio Camera - Chewing Gum Wrapper Sized to your Shopping Cart. Mini camera with audio and video recording, perfectly sized to be put inside a chewing gum wrapper for almost undetectable covert surveillance. This micro sized camera gadget is every lovers dream with features such as a micro SD card slot for up to 8GB of memory, a hold switch for making sure the camera does not accidentally switch off, 640x480 resolution digital clips in AVI format at 15 frames per second (15 FPS). Such a cool covert camera does not come around all that often, and Chinavasion brings this to you with factory direct low china wholesale price and we'll even dropship it to your customer. Note: The battery life for this unit is up to 2 hours between charges, however the unit will record videos in 1 hour sections. This is done to prevent videos from being too large. When you plug this product into your computer, special software will launch that automatically download any files you've created. Excelent spy cam , i´ve bought few times from here , good price and fast delivery. Good work guys. on 2009-02-25 01:15:13 it works very good.